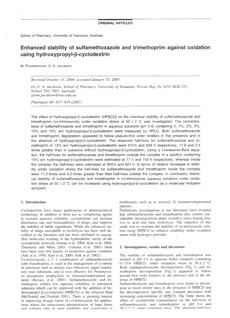 The effect of hydroxypropyl-β-cyclodextrin (HPβCD) on the chemical stability of sulfamethoxazole and trimethoprim (co-trimoxazole) under oxidation stress at 50 ± 2 °C was investigated. The concentrations of sulfamethoxazole and trimethoprim in aqueous solutions (pH 5.4) containing 0, 1%, 2%, 5%, 10% and 15% w/v hydroxypropyl-β-cyclodextrin were measured by HPLC. Both sulfamethoxazole and trimethoprim degradation appeared to follow pseudo-first order kinetics in the presence and in the absence of hydroxypropyl-β-cyclodextrin. The observed half-lives for sulfamethoxazole and trimethoprim in 15% w/v hydroxypropyl-β-cyclodextrin were 910h and 609 h respectively, 11.8 and 3.4 times greater than in solutions without hydroxypropyl-β-cyclodextrin. Using a Lineweaver-Burk equation, the half-lives for sulfamethoxazole and trimethoprim outside the complex in a solution containing 15% w/v hydroxypropyl-β-cyclodextrin were estimated at 77 h and 193 h respectively, whereas inside the complex the half-lives were estimated at 850 h and 821 h. In terms of relative increases in stability under oxidation stress the half-lives for sulfamethoxazole and trimethoprim inside the complex were 11.0 times and 4.2 times greater than their half-lives outside the complex. In conclusion, chemical stability of sulfamethoxazole and trimethoprim in co-trimoxazole aqueous solutions under oxidation stress at 50 ± 2 °C can be increased using hydroxypropyl-β-cyclodextrin as a molecular inclusion excipient.